Established Nov., 1868 by Gen. Alfred Sully with 5 companies of 3rd Inf. This was the supply base for Col. Custer's 7th Cav. Here, Dec. 2, 1868 Gen Sheridan received Custer returning from the Battle of the Washita. Name changed to Ft. Supply, 1889. Post abandoned 1893. Buildings now used by State as hospital. On U.S. Highway 270 at entrance to Fort Supply Historic Site east of Fort Supply, OK.
Fort Supply (originally Camp Supply) was a United States Army post established on November 18, 1868, in Indian Territory to protect the Southern Plains. It was located just east of present-day Fort Supply, Oklahoma, in what was then the Cherokee Outlet. It was built as a "Camp of Supply" for General Philip Sheridan's winter campaign against the Southern Plains Indians. Later, the camp served to protect the Cheyenne and Arapaho Reservations from incursions by whites. It was from Camp Supply that George Armstrong Custer led the Seventh U.S. Cavalry south to the banks of the Washita River to destroy the village of the Cheyenne Indian chief Black Kettle in what is known as the Battle of the Washita. 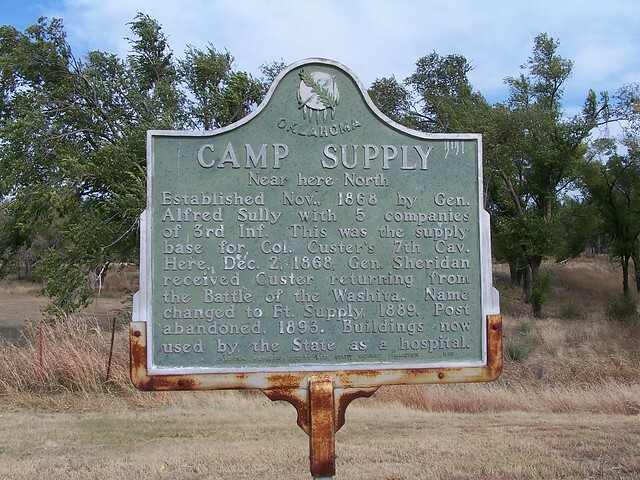 Camp Supply was renamed Fort Supply in 1878 following its role in the Red River War of 1874-1875. By 1880 the Indian Wars on the Southern Plains were nearly over and the fort was in bad repair. Army officers in the Department of Missouri recommended its abandonment. Philip Sheridan, by then General of the Army, objected and worked to establish the Fort Supply Military Reservation giving permanence to the fort and an accompanying reserve of 36 square miles. Fort Supply was officially closed September 1894 following the opening of the Cherokee Strip to settlement. One of the last missions troops from Fort Supply performed was bringing to end the violence of the Enid-Pond Creek Railroad War during the summer of 1894. Troops from Fort Reno and U.S. Marshal E.D. Dix and his deputies had been unable to quell the wrecking of trains, destruction of tracks, and demolition of trestles by residents from both communities. On February 26, 1895, the last remaining troops turned over operation of the old fort to the Department of the Interior. In 1908 Oklahoma located Oklahoma's first insane asylum at the old post—now called the Western State Psychiatric Center. In 1988, the state legislature designated the remaining buildings at the old fort as the Fort Supply Historic District. Shortly afterwards the William S. Key Correctional Center was opened at the site. The Fort Supply Historic District was placed on the National Register of Historic Places in 1971 (#71000675).